We recently finished remodeling our Kitchen which now includes a six burner Wolf duel fuel range/oven. I love it and am still playing with all the oven settings. I am a retired Aerospace Senior Manager. Cooking has always been my passion. I started really cooking while attending college after discharge from the Army. 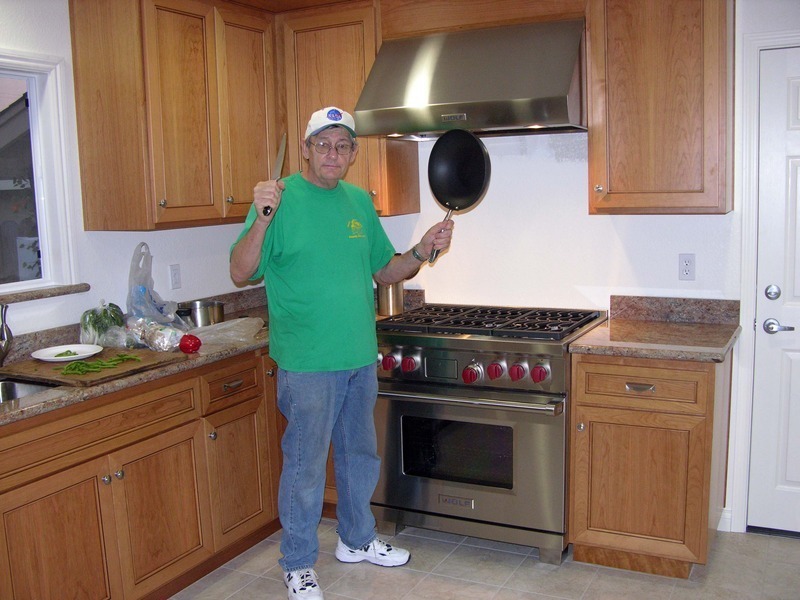 My wife worked; I went to school on the GI Bill and began doing much of the cooking. Over the years I have exploited various ethnic cuisines. I have also become passionate about smoking food. I like the aspect of pleasing family and others with something I created in the Kitchen. Though I have taken classes at the CCA in SF I can't afford the full tutition and they have stopped offering weekend classes for the enthusiast. I became a bit of a cookbook junkie for a number of years before the Internet made recipes so easy to get and find. My Mother. Though she wasn't a great cook she provided wholesome and tasty food for the family that was suited to a tight budget. My parents also exposed my brother and me to all sorts of Ethnic food which broadened the eating experience and made me anxious to try anything new. My great aunt ;"Aunt Mae." Being from Germany she cooked from scratch and from dawn until dusk. For her it was her job to feed the family; make sure no one went away hungry and provide three meals a day for those doing the work in a small Nebraska farm town. She baked bread from scratch EVERY day. She butchered her own poultry and pork. She had a garden that covered at least a quarter acre with crops for all seasons. She canned huge amounts of vegetables and fruits annually. Most importantly she had a heart of gold and a smile that was captivating. As for professionsl influences I would pick Jacques Pepin. A craftsman and a technician that creates amazing foods with simple ingredients and flawless technique. Watching him make an omlet is inspiring. The best pri fixe meal I have ever had. Unfortunately the recession and economy got them and they closed the establishment. A true shame. Hi Bob. Welcome. I love to cook also, but I'm in the baby stage of cooking. I love experimenting with recipes, tweeking them by adding different spices that I think would taste good in the dish. So far so good there. I'm looking forward to sharing with you. Hi Bob!! You are this weeks CookEatShare featured user! Make sure to swing by our Facebook page and check it out, and look for one of your recipes to be featured on Tuesday! Hello thanks for the follow and the nice comment! (I am following back, and can't wait to see your recipes). We think we have room for approximately 1000 cookbooks in the craft room. Right now we are at 824. Bob, thanks for all of your comments on my recipes. Just wanted to stop by and say hello. Wow you've posted some smoking hot recipes today, and I'd love to try each of them. Grilled Pork Tenderloin, Green Tomatillo Sauce and Annatto Rice are all going to my Try Soon recipes. I'm always fascinated by your presentation and photo tutorials, and even if I don't care for a particular recipe name, I open it anyway just to see and admire! Thanks for your cooking stimulation - you inspire many of us. Hey Bob, Thanks for the message in June. I always save your recipes, and make some of them. You're a great cook. 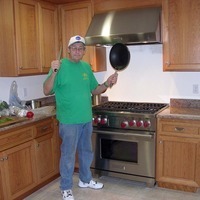 Bob I am so diggin your profile pic...you look like my kind of foodie friend! By the way if you wake up in the morning and your stove is missing It's cause I took it...WOW THAT'S A NICE STOVE! Thanks, just wondering if there was some special ingredient. Thanks for info about tri-tip. Will have to pick one up soon. Any special seasoning? I have learned a lot about smoking bbq - but have much to learn. Hi Bob. I see you have a skillet there. Just my style. I'll be waiting for your next recipe. Hi Bob - what is your daughter's last name. I'd like to follow her. The last name is Brazelton. You will see two listed--Sandee & Kristy. Neither has been terribly active on CES as yet. Hopefully that will change. Our two daughters married two brothers hence the same last name. Kristi: The last name is Brazelton. You will see two listed--Sandee & Kristy. Neither has been terribly active on CES as yet. Hopefully that will change. Our two daughters married two brothers hence the same last name. Hi Bob, Thanks for following me. I look forward to sharing recipes. I'm a big fan of tabbouleh and will give your recipe a try. Glad you joined Bob. That's a great collection of cookbooks, 400? Wow! I hope you enjoy the recipes here and I look forward to trying some of your favorite ones! Thanks for your comments. Certainly not a gastronomic force to be reckoned with but an old retired guy having fun with what he is passionate about. I have previewed several of your recipes and look forward to trying them and following your posts. Thanks so much for your reply. I know the kitchen photo might be a bit over the top but I had a 52 year old eletric stove top for 35 years. I'm like a hog in slop with the new Wolf dual fuel range. My Runza irecipe is farmland based for those working in the Nebraska wheat fields all day so it probably is fit for a trcukdriver. A recipe slightly altered from my "Great Aunt Mae." who was a wonderful Germay woman with a heart of Gold. Buttery Danish Kringle-Just 3 ingredients!